Not into newsletters? Get only new releases by following Gail on Amazon or BookBub. Or you are welcome to send Gail a calling card (scroll down). * How do I pronounce the “g” in Carriger? It’s hard, as in grrrrr. * ARC request? Please leave a calling card to review her self-published stuff (Parasolverse novellas, Tinkered Stars & San Andreas Shifters). Gail can’t provide you with early copies of her traditionally published works, please contact Hachette via their website to request ARCs. * Blurb request? Apologies, but Gail no longer provides cover blurbs by request. If she has already reviewed your book on Goodreads or BookBub, feel free to contact her for a quote. Why is this the case? Be warned Gail pretty much only reads queer comfort these days (light hearted queer protag books with happy endings). * Questions? This website is kept up to date by Gail. Please do not ask for information already available here. At the very least, try Gail’s FAQ first. * Student? Gail will not do your homework for you. She does not write for free. Here is a ton of resources. You may also contact Gail via her literary agent, Kristin Nelson. Sadly Gail can not be your pen pal, nor is she qualified to be your counselor or writing coach. Parasolverse Wiki: Please contribute because Gail needs your help! Gail Carriger & Piper J. Drake also have a podcast all about traveling writers. Check out 20 Minute Delay because they aim to help with all your travel quandaries. Gail’s literary agent is Kristin Nelson of Nelson Literary Agency. If you are interested in submitting, you can find guidelines on that website. If you are looking for insider TIPS, try Kristin’s blog. Gail has been with her for over a decade, so yes, she recommends her. Gail is not a literary agent herself. The Parasol Protectorate and Custard Protocol books are published first by Orbit US. The Finishing School books are published first by Little Brown Books for Young Readers. 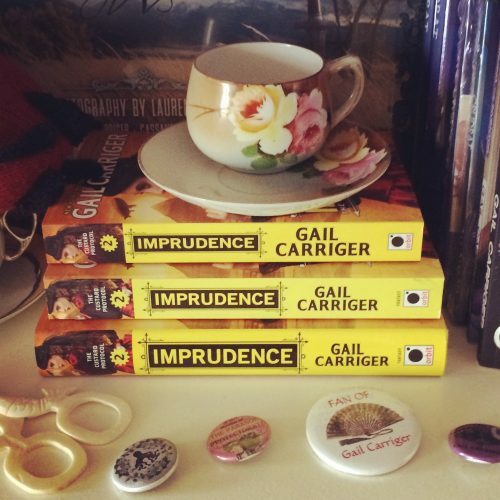 The San Andreas Shifter, Tinkered Stars, Delightfully Deadly, Supernatural Society, and Claw & Courtship series are published under Gail’s own imprint, GAIL CARRIGER LLC.